With the aftermath of what seemed to be a minor ski fall last winter, it was time to send the alpine ski equipment to a new home. It didn’t take much thought to get my priorities straight. Would I take another chance on missing months of running, then work through the required slow buildup to return to my previous mileage and pace? No. So, as soon as the drop-off schedule for the ski swap was announced, on my calendar it went. Months later, the reminder popped up. Day 1: Skis, poles, helmet, boots, ski pants all loaded up ready for the first day of a two-day window to deliver items for sale. I fully intended to be there at the opening bell. Instead, errands and miscellaneous got in the way. Too late, I realized I wouldn’t have time to do the ski drop and arrive on time to do speed work with my training group. The ski swap lost out. Day 2: Better do this in the morning before the day slips away again and the equipment stored for another year. I started off for the ski swap, but decided to fuel up first. Back on the road my vehicle suddenly veered into the parking lot of my favorite ice cream stand, still open on this beautiful late autumn/early winter day. What was going on that I found myself mid-week, mid-day, stopping at an ice cream stand when my window is nearly closing to drop off the never-to-be used-by-me-again ski equipment? I contemplated this question as I enjoyed my very favorite Caramel Turtle Fudge Sundae. I arrived at the ski swap within an hour of the close for deliveries. Opening the hatch, I placed the helmet on my head, skis and poles slung over one shoulder and ski boots over the other. Lifting the boots, I recollected that during my years of off-again, on-again skiing, the ski boots were too heavy, too awkward and ultimately uncomfortable. Carrying those ski boots one last time, I was at ease with my decision to divest. And quite frankly, skiing is my least-skilled sport. The knowledgeable ski sale volunteer helped me determine a reasonable asking price. The Susquehanna Ski Club has a great system where I could check online to determine whether my items had sold. If no sale the first day of the swap, I could return and authorize a markdown. An early Sunday morning online check indicated all my merchandise was sold. No need to return to the scene of ski equipment abandonment. Transition time. My snowshoes are out and in use. They weigh far less than my skis, take less storage space, are great for cross-training when surfaces aren’t great for running, and certainly travel better. Wishing everyone an active December, whatever your sport. Yes, I’m sure the ice cream gave me courage. And I love the crunch of snow under my boots. I think I’ve been to that ski swap, but on the purchasing end! And I have to say that after a great nordic ski experience last winter in Maine, I think I may abandon future alpine skiing as well. The ski swap is huge and they are careful about the equipment they accept to sell. 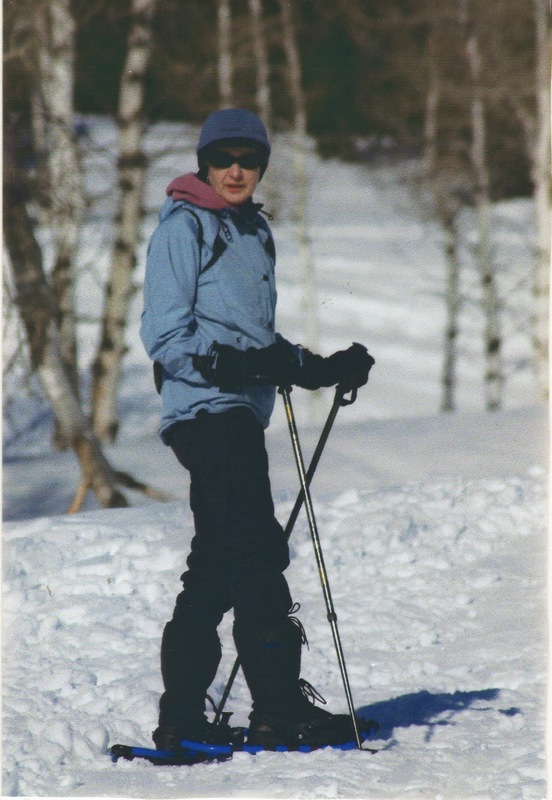 Nordic skiing in Maine sounds great – and what a wonderful workout. I need lessons to become a x-country skier but snowshoeing is far more convenient. Which is what we’ve been doing in the Canadian mountains for the past decade. 🙂 My partner used to do downhill mogul skiing in Europe, etc. in his 20’s to early 30’s. Then x-country skiing. Now snowshoeing. He still cycles a lot since we’re car-free. He’s 70 and I’m 54. As a jogger, you know cycling can save your knees…one day.